Arunachal Pradesh Chief Minister Pema Khandu has expressed deep concern and anguish over repeated occurrences of fire incidents across the State, the latest being one at Pasighat. 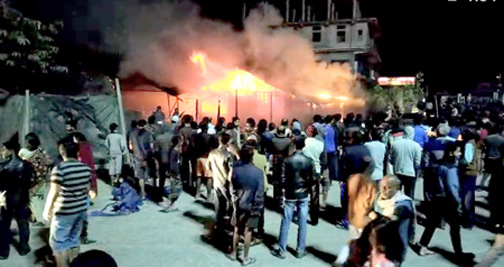 About 34 grocery and vegetable outlets of one APMC market shed were completely burnt down on Monday night at Gandhi Chowk in Pasighat causing huge loss to vegetable and grocery vendors. Khandu has sought a detail report on the incident from the district administration while directing it to assess the loss caused and provide relief to the victims as per norms. The Chief Minister repeated that almost all fire accidents are man-made and can be prevented with just a sense of responsibility. He appealed to the citizens to act responsibly and douse every little fire before leaving their home or retiring for the night. He emphasized on extra vigil during the winters as most homesteads use fire for warmth besides cooking. “We cannot douse a blazing fire without incurring huge loses but we can sure douse a spark or prevent a kindle from spreading and save ourselves and our neighbours. With common sense and responsibility we can use fire to our advantage, not for self-destruction. I fervently appeal all to be wary of fire and do not neglect a spark,” Khandu appealed. He also gave strict directions to the administration and concerned departments to continue creating awareness amongst the people besides keeping fire-fighting men and machineries handy all the time. The Chief Minister also called upon civil societies and individuals to extend assistance in whatever way possible to offer relief to the victims who might have lost everything they had for livelihood.